Abstract. The North Atlantic spring bloom is a massive annual growth event of marine phytoplankton, tiny free-floating algae that form the base of the ocean's food web and generates a large fraction of the global primary production of organic matter. The conditions that trigger the onset of the spring bloom in the Nordic Seas, at the northern edge of the North Atlantic, are studied using in situ data from six bio-optical floats released north of the Arctic Circle. It is often assumed that spring blooms start as soon as phytoplankton cells daily irradiance is sufficiently abundant that division rates exceed losses. 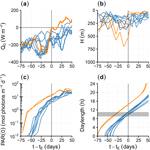 The bio-optical float data instead suggest the tantalizing hypothesis that Nordic Seas blooms start when the photoperiod, the number of daily light hours experienced by phytoplankton, exceeds a critical value, independently of division rates. The photoperiod trigger may have developed at high latitudes where photosynthesis is impossible during polar nights and phytoplankton enters into a dormant stage in winter. 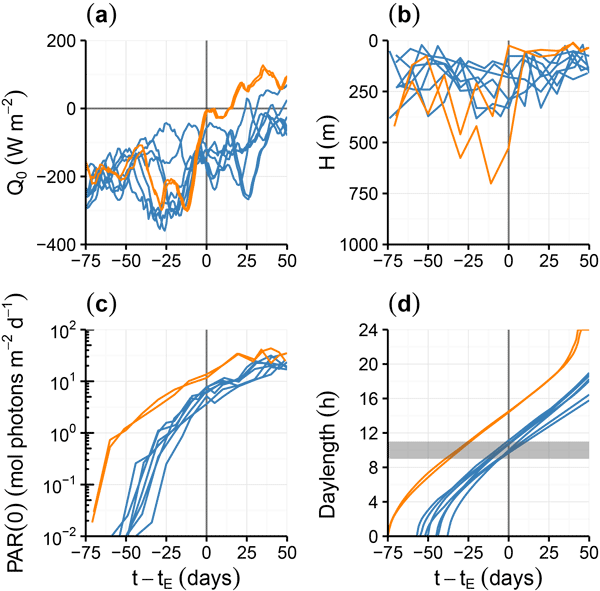 While the first accumulation of biomass recorded by the bio-optical floats is consistent with the photoperiod hypothesis, it is possible that some biomass accumulation started before the critical photoperiod but at levels too low to be detected by the fluorometers. More precise observations are needed to test the photoperiod hypothesis. How to cite: Mignot, A., Ferrari, R., and Mork, K. A.: Spring bloom onset in the Nordic Seas, Biogeosciences, 13, 3485-3502, https://doi.org/10.5194/bg-13-3485-2016, 2016. We investigated the bloom onset in the Nordic Seas using 6 bio-optical floats. We found that the float data are consistent with two possible scenarios for the onset of blooms in the Nordic Seas. The Nordic Seas blooms could have started either when the light became sufficiently abundant that the division rates exceeded the loss rates, or when the photoperiod, the number of daily light hours experienced by phytoplankton, exceeded a critical value.